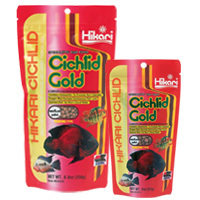 Hikari Cichlid Gold is an excellent daily diet for larger tropical fish whose vivid coloration has become washed out. Also an excellent choice for fish who require higher protein levels. Hikari Cichlid Gold offers superior color enhancing capacity while helping your pet retain their beauty year round. Expect excellent growth rates. High in stabilized vitamin C which promotes resistance to stress and immunity to infectious disease thereby allowing your pet their best chance at maintaining good health. This floating pellet will not dissolve or cloud your aquarium water.